Has the LG G2 Mini been revealed before MWC 2014? Rumours surrounding the LG G2 Mini have been circulating for a while and now it seems the Korean firm has jumped the MWC 2014 gun and gone and announced it - although that's not what LG says. TechRadar spoke to a LG spokesperson who said "we have not released any information on the so called LG G2 Mini." According to Dutch site GSMInfo the information it's posted comes direct from LG - although we're taking this with a pinch of salt for the time being. 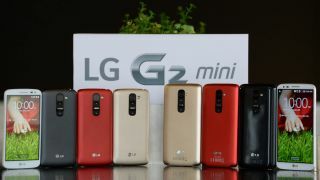 The alleged specs list show LG G2 Mini may follow its bigger brother the LG G2 with a 4.7-inch qHD 540 x 960 display; we're not really looking at a 'mini' handset here then, measuring 0.7 inches larger than the iPhone 5S and the same size as the HTC One. Worries immediately creep in over the qHD resolution (don't get confused with QHD 2K resolution, that is completely different) as it would be noticeably low res, on par with the Samsung Galaxy S4 Mini but stretched even further and without the Super AMOLED tech behind it. This means a only 234ppi compared to the 256ppi of the S4 Mini and far less than the 341ppi of the HTC One Mini. The same specs sheet shows that the LG G2 Mini should also come with a 1.2GHz quad-core Snapdragon 400 CPU backed by 1GB RAM that will keep a skinned Android 4.4 KitKat running smoothly. The skin is set to contain LG's Guest Mode as well as the fantastic Knock-On feature. This is supposed to come wrapped in a 130 x 66 x 10 mm frame so again we're not looking at a 'mini' handset rather a device that could be rather chunky. Elsewhere we are potentially going to see an 8MP rear sensor and 1.3MP front snapper, 8GB of internal storage with microSD support and 4G LTE support. We may also get a 2440mAh battery. It is also expected to launch in the Netherlands in April so we would anticipate a similar launch time elsewhere. The LG G2 Mini will have some serious competition on its hands from the well established HTC One Mini, Galaxy S4 Mini and Sony Xperia Z1 Compact, let alone the rumoured Galaxy S5 Mini, so it'll be interesting to see how it fares.